It was one of those half silly, half embarrassing conversation most bloggers have had at one time or another. “So what do you do with your time these days” (the final phrase “now that you are waiting to die” was implied rather than said)? “Well, I do a little writing”. I longed to say something daft such as “the instructions on the back of seed catalogues”, “self-help books on constipation”, or “epic poems in Gaelic”, but settled for the old stand-by. By now my conversational partner is clearly wishing that she had initiated a conversation about something more interesting such as the weather or the price of a pint of milk. I could see her, trawling her conversational fish-stocks, looking for the next sentence with all the ardour of T S Elliot in mid-stanza. For a moment I struggle with the interpretation of the word “read”, wondering whether it is an inquiry into the political foundations of my writing, but decide that it is merely an awkward sentence. I feel confident in my diagnosis as I am a bit of an expert in awkward sentences. She seems happy to allow the conversation to die a natural death at this point and turns her attentions to something more interesting such as clinically inspecting the possible content of the sandwiches. But, as an annoying know-it-all, I dislike being asked questions I don’t think I know the answer to, so I prod my iPhone until I reach the Blogger statistics page and go in search of the one post in all the thousands I have published in the last nine years which has received the most page views. The answer surprises me. 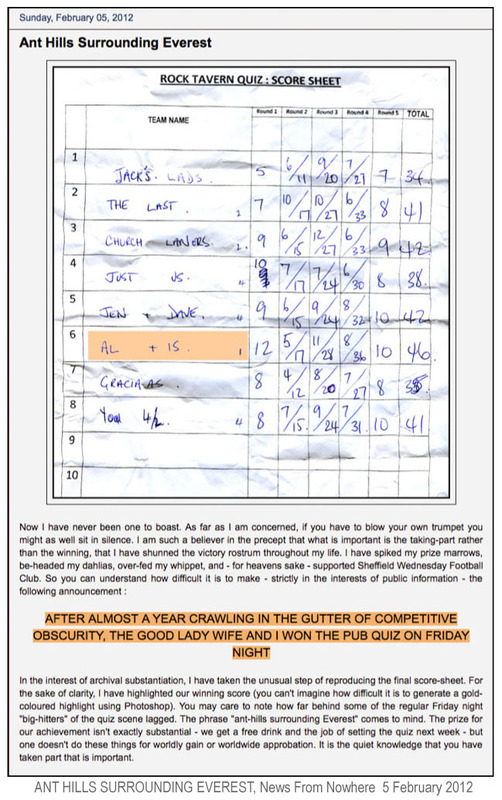 It is a ridiculous little post I did back in February 2012 about winning the Pub Quiz which was accompanied by a scan of the Score Sheet. What few words there are, are not particularly well-chosen and the subject matter is on the same level as paint drying in terms of capturing people’s attention. Nevertheless, the piece – which is entitled Ant Hills Surrounding Everest – has had 5,947 page views which is probably more that any of the plays of Shakespeare had during his lifetime. I go in search of my inquisitor in order to provide her with the knowledge she was so clearly seeking. She is talking to someone else, but I interrupt as I am older than the person she is talking to and with less time left on this earth. She looks at me with an odd mixture of alarm and pity and then widens her view to see if she can spot a carer who should be looking after me. I really must stay in more often.